Many women want long and full hair but have trouble growing it themselves. Hair extensions are often worn to fulfill this desire. Hair extensions come in many textures and colors and are most often purchased by salon owners and beauticians for professional use. Luckily, high quality extensions are also available to the public and are very simple to put in. One of the fastest and easiest ways to wear hair extensions is in an elegant ponytail. 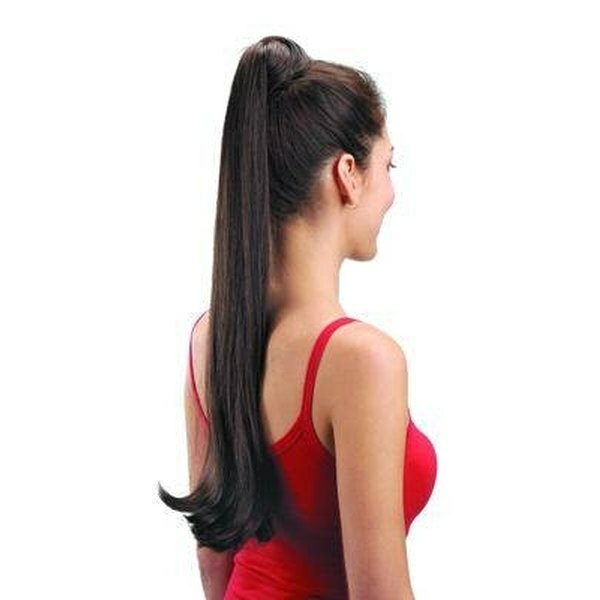 Ponytails are a popular choice among women who want a low maintenance hairstyle that is also stylish and sophisticated. The following steps will instruct you on how to make ponytail pieces with hair extensions. Hair extensions come in wefts. The weft is the piece along the top of the extension that the hair hangs from. The length of the hair weft should be at least 12 inches long. The actual hair that hangs from the weft comes in a variety of colors and styles. Decide on the style of hair that you will be using. Pull your own hair into a ponytail and secure it tightly with a rubber band. Check in the mirror to make sure that their are no loose strands hanging and that the ponytail is placed where you want. Place the hair extension weft flat on a solid surface so that it is completely unrolled. Comb through any hair hanging from the weft that may be tangled or misplaced. Hold one end of the weft in your hands. Tuck this end slightly beneath the rubber band that is holding your ponytail, and use a bobby pin to pin it in place. Loop the hair extension around your ponytail once and pin it into place. Continue looping the hair extension around the ponytail, and pin in place each time you do so until the entire extension is pinned in. Pull aside a small section of hair from the ponytail. Wrap this small section around the ponytail to cover the weft seam and the rubber band. Use a bobby pin to secure this section of hair in place. Use a longer hair weft to add fullness.